“Simplicity drives execution.” According to Mike McNamara, CEO of one of the world’s largest contract manufacturers, this sums up the reason why Flextronics chose Workday. 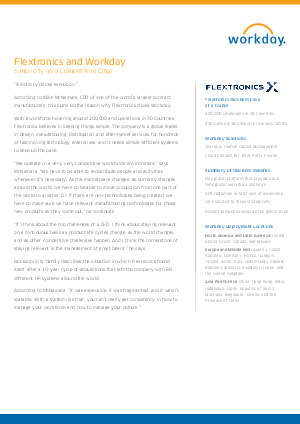 With a workforce hovering around 200,000 and operations in 30 countries, Flextronics believes in keeping things simple. The company is a global leader in design, manufacturing, distribution, and aftermarket services for hundreds of fast-moving technology enterprises, and it needs simple, efficient systems to keep up the pace. This case study reveals the Human Capital management and Integration Cloud solutions provided by Workday. Download now to discover the main business benefits of Workday.